On Sunday night, the Indian Navy’s aircraft carrier with a displacement of more than 40,000 tonnes achieved a speed of 29.3 knots, while sailing into the wind and against the current. The crew and sea trials team of the aircraft carrier INS Vikramaditya, which is undergoing tests in the White Sea, gave themselves and their families the best possible present for Russia’s Navy Day. On the night of July 28, the ship’s main propulsion system was brought up to maximum power – the temperature in all eight boilers was raised to the upper limit, and they worked successfully. As a result this gigantic surface vessel with a displacement of more than 40,000 tonnes achieved a speed of 29.3 knots, thereby exceeding the expectations set for its design specification. One of the first to hear the news was Sevmash shipyard veteran Eduard Leonov, the father of Igor Leonov, who is responsible for delivering the ship to its new owners. The Leonov dynasty of shipbuilders: Eduard Petrovich (centre), Igor Eduardovich (left) and Dmitry Igoryevich. Severodvinsk, 2013. Source: family archive. The first information about this was also leaked to the Indian media, although there was no confirmation from Russian official sources. This is understandable, of course: the Vikramaditya belongs to the Indian Navy, which has been in charge of the refit and is now in charge of the trials. As a client, our Indian partners decide for themselves what to communicate, when and to whom. We accept this position and respect it. But at the same time, how can we not be delighted with the overall success of the Russian shipbuilders, together with the Leonov family of shipbuilders, three generations of which are already linked with the Vikramaditya? The head of this dynasty, Eduard Petrovich Leonov, spent more than 30 years building and testing nuclear-powered submarines and delivering them to our sailors, and at the beginning of the 2000s he was, as they say, thrown into refurbishing and refitting the cruiser Admiral Gorshkov, converting it into the aircraft carrier Vikramaditya, and became pretty much the main connection between the design office and the shipyard construction team. His son, Sevmash engineer Igor Leonov, who celebrated his fiftieth birthday in June of this year, became responsible for delivering this order (one of the most difficult Sevmash has ever handled) to the client when he was just over 40. And what does this responsibility mean? One the one hand it means he’s the tsar, God and a military commander all in one person, and on the other hand he’s the whipping boy, the one who carries the can in every situation when something doesn’t come together or there’s a glitch, or simply when things don’t happen on schedule. Igor Eduardovich, who’s had up to 3,000 to 4,000 people working for him at different times, had been through all of this. And he was not afraid to take on board his own son, who has already managed to acquire the necessary specialist training, as well as a wife and son. Igor Dmitriyevich, the fourth man in the Leonov dynasty, has not yet set foot on the aircraft carrier’s deck, but he has already learned to stand and will definitely come with his mum and his great-grandfather to meet his father and grandfather when they return to port. 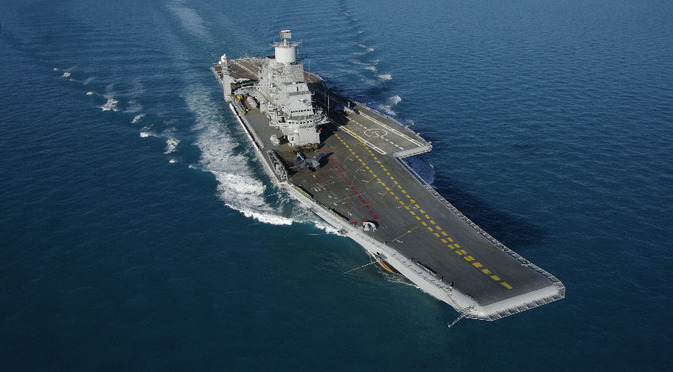 If all goes according to plan, Vikramaditya’s trials, including fine tuning of operational liaison with the carrier’s aircraft in the Barents Sea, will conclude at the end of August. It’s worth recalling that the trials currently underway are a kind of repeat exam for the aircraft carrier, its sea trials crew and everyone involved in delivering its equipment, including Baltiysky Zavod, where the boilers were manufactured. In June–August of last year the Vikramaditya had already shown what it could do in the White Sea and the Barents Sea. Serious problems were revealed at that time in the operation of the boilers. The aircraft carrier returned to Sevmash on September 23, 2012 so that they could be repaired and other issues that had come to light could be dealt with. Over the following nine months the fireproofing in all eight boilers of the ship’s main propulsion system were replaced (or repaired). At the same time some issues to do with repairing imported equipment were addressed. The aircraft carrier sailed into the White Sea on July 3, as planned. The ship’s manoeuvrability and speed were checked, and test flights were carried out to check the electronic warfare systems of auxiliary aircraft. Here, in the White Sea, the Vikramaditya took on board a significant proportion of its Indian crew and was refuelled for its passage into the Barents Sea, where trials involving the ship’s aircraft will be conducted. The Severodvinsk shipyard’s press office explained that the aim of these trials is to check individual systems and items of equipment on the ship. Another important objective is practical training for the Indian crew. Most of them will arrive in Severomorsk on August 3-4 and transfer immediately to the aircraft carrier. It is planned to complete the full cycle of trials by October 15. After this a further month is allocated to dealing with minor issues. The documentation for delivery of the aircraft carrier Vikramaditya to the Indian Navy is scheduled to be signed on November 15. After this the ship will make its own way to its permanent base on the Indian Ocean shore, manned by its Indian crew and a small number of the Russian sea trials team (headed by Igor Leonov, as requested by the Indian side).